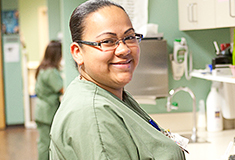 UCLA Health is committed to employing the most expert nursing staff. This involves remaining on the cutting-edge of knowledge and technology. On an annual basis, a team of nursing experts-including nursing management, Clinical Nurse Specialists and unit-based educators-carefully evaluate the unit-based learning needs and competencies of staff. A structured program, comprised of lectures, hands-on training and evaluation, is provided to ensure that direct care nurses are performing at the highest level necessary to provide safe and effective patient care. Annual competencies will include 'general' patient care topics, such as central venous line care and blood administration and unit-specific topics such as hemodynamic monitoring. Training on new technologies, such as medication bar coding, is provided throughout the implementation period and may also be an annual competency. Annual competencies are held at orientation and once a year. For a comprehensive list of completed online learning modules, please go to Employee Online Training Completion Report. If you need to reprint a certificate for an online learning module, please go to Certificate Reprint.